The environmental badge for fine particles has been introduced in Germany on the 01/03/2007 and is available in the colours red, yellow and green. 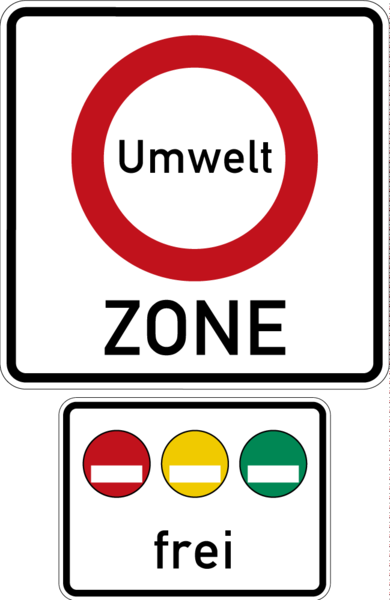 Only the green badge allows the entrance to the around 60 German environmental zones. 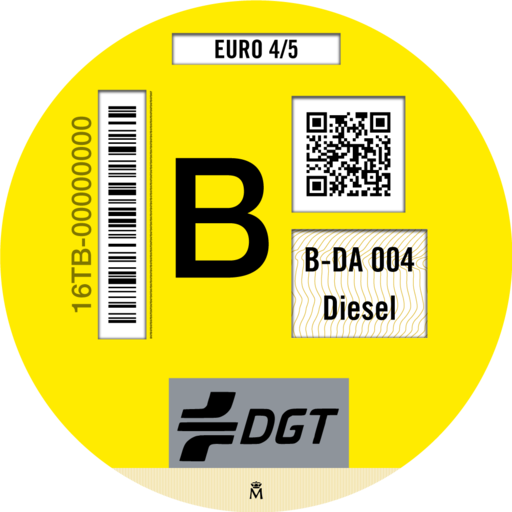 The obligation of bearing the environmental badge in Germany has been introduced for all cars, buses and trucks. Light utility vehicles are exempted from the obligation of bearing the environmental badge. The German environmental badge (also called badge for fine particles in the law) is divided into three different pollutant classes. The registration number of the vehicle as well as a stamp from the official issuing authority are shown on the badge. The colour of the badge depends on the emission norm of the vehicle. 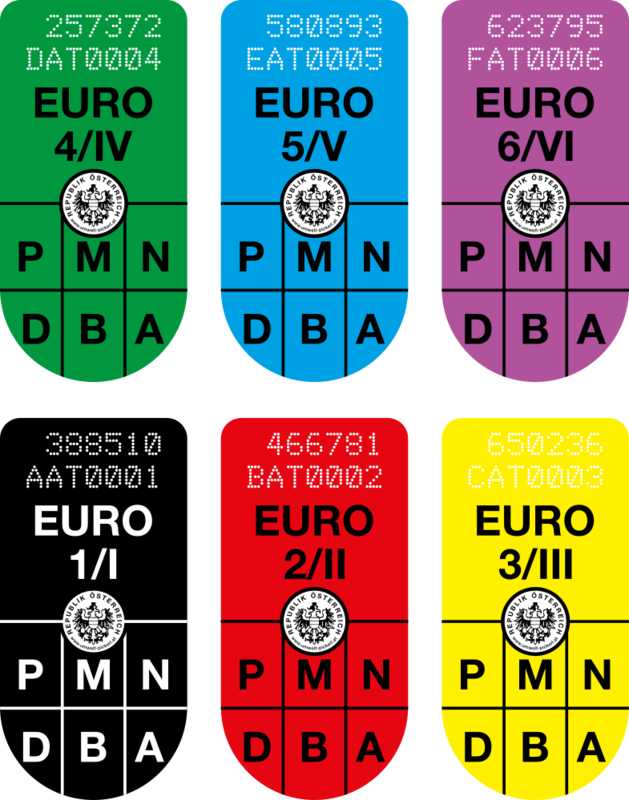 For vehicles registered abroad, this will be specified in a EURO classification table depending on the first date of registration and on the EURO norm of the vehicle. You can order here the German environmental badge for the green environmental zones in Germany. 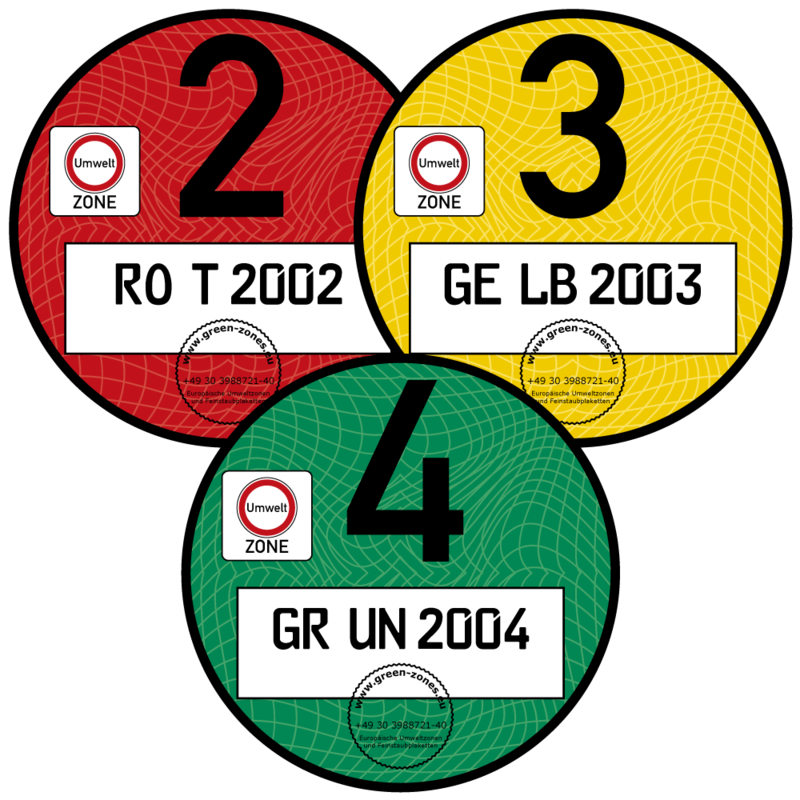 In Germany around 60 environmental zones have been introduced and all vehicles of the N1-N3 and M1-M3 categories (cars, buses and trucks) are obliged to show the badge. The introduction of the environmental zones in Germany has been decided by cities and municipalities, which define the limits of the environmental zones and establish the clean air plans. 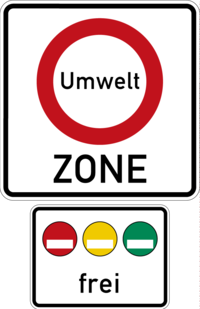 The limits of the respective local environmental zones and the specific exemptions are shown on the website Umwelt-Plakette.de in different languages. In 2018 diesel restrictions and blue environmental zones will be introduced, adding up to the existing permanent environmental zones. These informations can be found on the information website of the Blaue Plakette. As the different emissions like particulate matter, sulphur dioxide and nitrogen oxides also have to be reduced in Germany, it is only permitted to drive into all German environmental zones, except one, with the green environmental badge. Furthermore, from 2018 only vehicles with legally allowed NOx emissions will be permitted to circulate in German cities. This will be regulated by diesel restriction zones (general traffic ban for diesel vehicles) or a blue badge, which corresponds to the emission norm 5 and is allocated to both gasoline vehicles and low-emission diesel vehicles. The blue badge allows to drive into the so-called “blue environmental zones”, which can be added to the already existing green environmental zone by the respective city. The blue environmental zones will be introduced where the NOx emission level is particularly high and the legal limits have been exceeded. The blue environmental zones or traffic bans for diesel vehicles could be introduced permanently and with fixed limits. The permanent environmental zones can be compared to the green environmental zones. The temporary environmental zones, which depend on weather conditions, only apply to specific times. In order to be informed about the current status of the temporary zones (which vehicle with which badge is allowed to drive), check the traffic restrictions in real time on the Green-Zones-App. 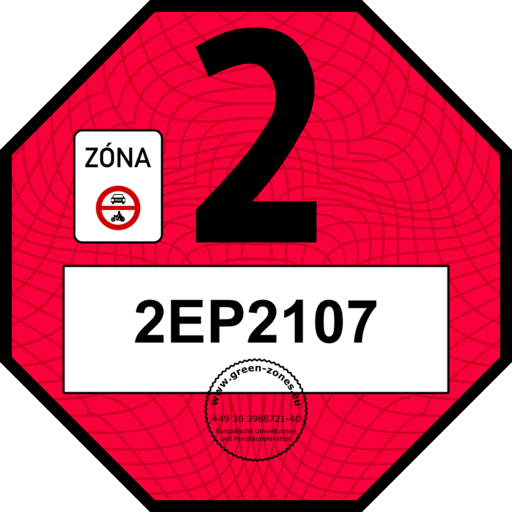 All European environmental zones – which traffic restrictions apply to which days, vehicle type and with which badge /vignette? Buying a badge/vignette for French, German, Austrian, Danish or other European environmental zones is often not enough. More important for the European commercial transport and the touristic private and bus transport is to know which colour or class of the badge/vignette apply to a national environmental zone for fine particles and NOx environmental zone (traffic restrictions on diesel vehicles). Equally important is to know which one of the 17 different European vehicle types and to which times and weekdays is allowed to drive or not into the permanent or temporary environmental zones. The answers to these questions are available for free to all Green-Zones customers on the Green-Zones-App. 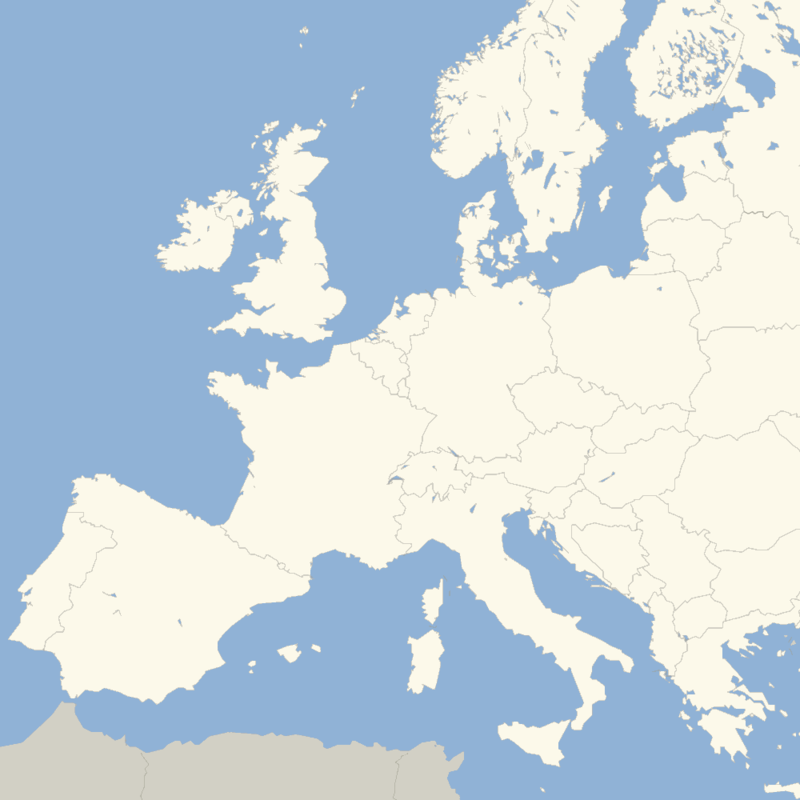 The Green-Zones-App works with data from the Green-Zones database which contain national and local regulations of a specific European country and its subordinate cities and municipalities. Moreover, the App allows to update information about traffic restrictions and permanent disruptions of previously authorized badges and vignettes in all permanent and temporary European environmental zones, for all different vehicle types and EURO norms in Europe. Additional information about the Green-Zones-App is available in 9 languages here. The French environmental badge Crit'Air is compulsory in all French environmental zones for all vehicle types. Information about the French environmental badge Crit'Air is available in 9 languages here. The purchase of the French environmental badge Crit'Air is available in 9 languages here. 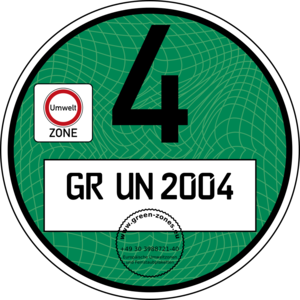 The Austrian environmental badge Umwelt-Pickerl (legally named Abgas-Pickerl) is compulsory in all Austrian environmental zones for specific vehicle types. Information about the Austrian environmental badge Umwelt-Pickerl is available in 9 languages here. The purchase of the Austrian environmental badge Umwelt-Pickerl is available in 9 languages here. 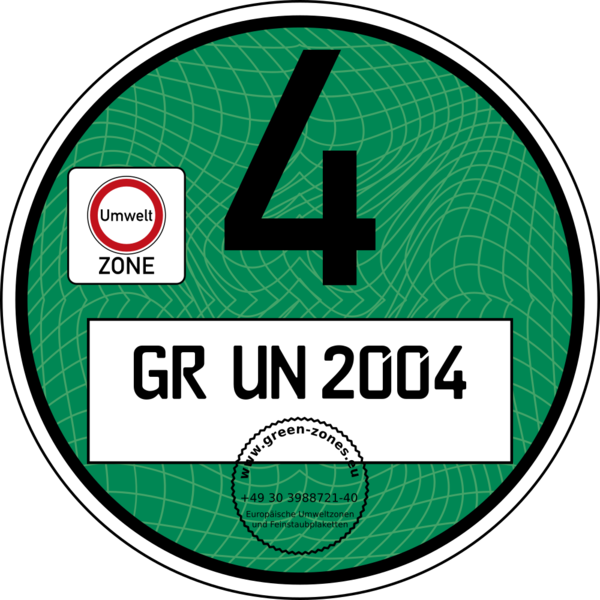 The German environmental badge Umwelt-Plakette is compulsory in all German green environmental zones for almost all vehicle types. Information about the German Umwelt-Plakette is available in 9 languages here. The purchase of the German Umwelt-Plakette is available in 9 languages here. 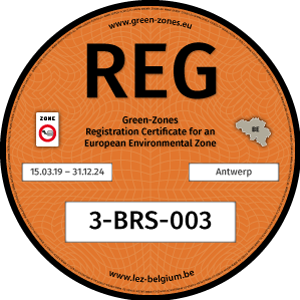 The Green-Zones REG-Certificate is the visual proof of a vehicle registration which enables access to a Belgian environmental zone. Information about REG-Certificate is available here in 9 languages. Order the REG-Certificate here in 9 languages. 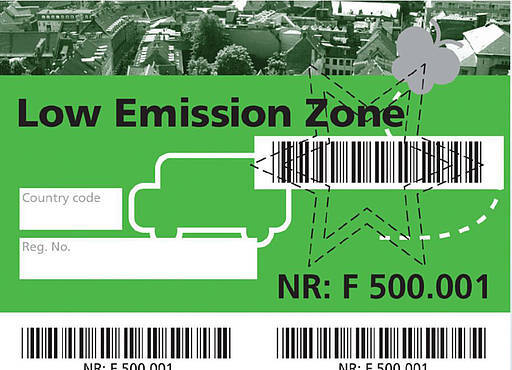 The Danish environmental badge EcoSticker is compulsory in all Danish environmental zones for specific vehicle types. Information about the Danish EcoSticker is available in 9 languages here. The purchase of the Danish EcoSticker is available in 9 languages here. The German E-Plakette offers many advantages to the electric vehicles registered abroad which drive through the German cities. Information about the E-Plakette is available in 2 languages here. The purchase of the E-Plakette is available in 9 languages here. The Spanish environmental badge Distintivo Ambiental has been introduced in Spain in 2017 and it will be also applied to vehicles not registered in Spain in 2018/2019. Information about the Spanish environmental badge Distintivo Ambiental is available soon by Green-Zones. The purchase of the Spanish environmental badge Distintivo Ambiental is not available at the moment. 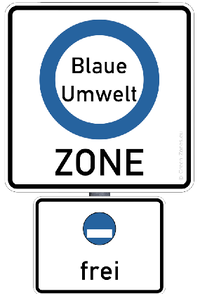 In 2018/2019 the German NOx badge Blaue Plakette will be presumably introduced in the German zones where traffic bans for diesel vehicles exist or in the blue environmental zones (NOx protection zones). 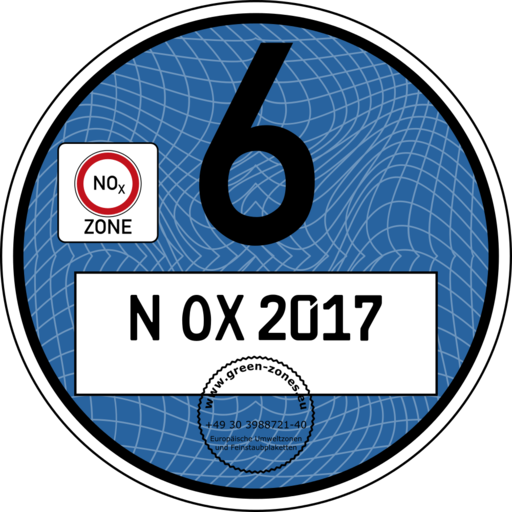 Information about the German NOx badge Blaue Plakette is available in 6 languages here. The purchase of the German NOx badge Blaue Plakette is not available at the moment. The Czech environmental badge Emisni Plaketa will be presumably introduced in the Czech environmental zones in 2018/2019. Information about the Czech environmental badge Emisni Plaketa is available in 4 languages here. The purchase of the Czech environmental badge Emisni Plaketa is not available at the moment.